SFWA’s Estate Project manager Bud Webster died February 14. He had been suffering for over a year from bile duct cancer and was in hospice care for the last weeks of his life. Born Clarence Howard Webster in Roanoke, VA in 1952, he studied music at Virginia Commonwealth University, majoring in composition. He was a fan for over 40 years, becoming involved in fandom in the early 1970s, and he was a pro for over 20 years, beginning when his first published story “The Rabbi’s Tale” appeared in Bill Bridges’ Drums Around The Fire anthology (1993). His fantasy fiction appeared in F&SF, other genre magazines, and collections. Webster’s most popular fiction was the four Bubba Pritchert stories that appeared in Analog, starting with “Bubba Pritchert and the Space Aliens” (July, 1994). Two stories in the series came in at the top of their category in the annual Analog Readers Poll (1995, 1997). Bud Webster is a big know-it-all who can empty a room in three minutes just by blabbing trivia about science fiction and fantasy…. 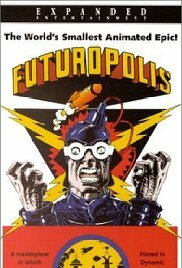 He also worked on Steve Segal’s and Phil Trumbo’s film Futuropolis (1984), voicing a bearded guard, a computer, and Spud. Webster was a respected sf historian, too. 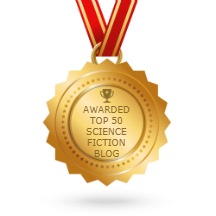 He discussed long neglected genre works in F&SF’s “Curiosities” department. His Past Masters and Anthopology 101 columns for various publications including the SFWA Bulletin (available as free reads here), were collected in Past Masters, & Other Bookish Natterings (2013), and Anthopology 101: Reflections, Inspections and Dissections of SF Anthologies (2010). 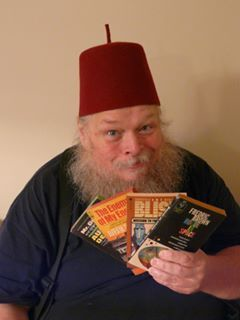 His autobiographical The Joy of Booking (2011) chronicles Bud’s adventures as a collector and seller of science fiction books at regional conventions. I was already a fan of Bud Webster’s Past Masters column, thoughtful biographical pieces on the enduring impact of our finest writers, when I first approached him to become a Contributing Editor. His first article for us, a marvelous discussion of Tom Reamy, and a continuation of his Who? series on neglected genre authors, appeared in Black Gate 15. ….It was the beginning of a long and fruitful partnership with Bud. He was briefly our poetry editor, before the death of the print magazine made that title superfluous. 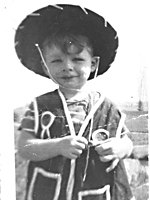 He became a prolific early blogger for us, contributing a dozen posts, mostly on his favorite subjects — the pros and cons of selling vintage books, his role as an stfnal historian, and the magical books that first lured him into the hobby. ONeill’s obit includes the text of Webster’s last column proposal, bound to be an interesting and controversial one, that was never written because his health failed. As a poet, Webster’s most famous work was the narrative SF hobo poem, “The Ballad of Kansas McGriff,” which took first place in the National Hobo Association Rendezvous 2000 Poetry Contest, where he read it to an audience of over 5,000 hobos. Webster won the 2012 Service to SFWA Award for his efforts on The Estate Project, which collects information about deceased members of the professional sf community. This data is used by editors, publishers and agents to research rights, obtain permissions, make payments, and ensure legitimate publication without copyright violations. Michael A. Ventrella interviewed Webster in 2014 and learned how he became SFWA’s point man for author estates. Do you want your intellectual property rights to be so profoundly screwed up that your heirs sell it off just to be rid of the bother, or so unutterably confused that it will take years to straighten out? Okay, then, start thinking about what to do now, while you can still make phone calls, send e-mails and sign papers. Bud is survived by his wife and long time companion Mary Horton whom he married in 2013. Update 02/15/2016: Added information from Kermit Woodall’s comment on another post. The out-of-pocket medical expenses that Bud and Mary have incurred are staggering. Many of you have asked how you can help. Donations for these medical expenses are being accepted through the MarsCon online store at https://squareup.com/market/marscon. All donations will go to offset these expenses. Thank you for any help you can give. Curt Phillips reported here in December that Bud Webster is in hospice care. 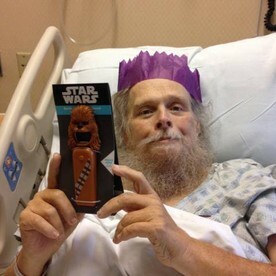 By Curt Phillips: One of our own — Virginia fan and SF writer Bud Webster — is in hospice care at a Richmond, VA hospital. He’s battled a long illness and endured multiple surgeries in recent months, and he has reached the end of his journey. Let me be clear about this; Bud is not expected to rally or recover. Hospice care is end-of-life care. His wife Mary is with him at the bedside, and some friends have been able to visit and express their concern and affection for Bud. Long-time friend Alan Wold visited yesterday and reported that Bud was responsive and still sassy; an observation that will come as no surprise to those who know Bud best. There is a Facebook page called “Bud Webster Fan Page” where comments and greetings can be posted, and I have reports that Bud is able to receive these, although I’m not sure if he can read them himself or if someone else is reading them to him. Those who’d like to post a message to Bud are urged to so so soon, as time is not our friend in this situation. Bud has served as the Estates coordinator for SFWA for several years and has taken the lead in tracking down the heirs of many of science fiction’s deceased authors. In the old book community, Bud has received high praise for an extensive series of essays and articles about genre topics. Many of these are collected in his books Anthopology 101: Reflections, Inspections and Dissections of SF Anthologies (2010) which reviews and discusses many of the most important science fiction anthologies from our early years, The Joy of Booking (2011) which chronicles Bud’s adventures as a seller of science fiction books at regional conventions for many years as well as his own thoughts on being an accomplished science fiction collector, and Past Masters, & Other Bookish Natterings (2013) which examines the careers of many of the best and most unfairly neglected writers in the field. Those who love the history of science fiction would do well to read these books and learn some of the wisdom of a master bookman. Bud is an old friend of mine from back in the days when we were both involved with a long ago SF convention called RoVaCon and the old Roanoke, VA fan group, The Nelson Bond Society. He and I share a common love for collecting vintage science fiction books, and though we’ve spent years discussing them, it still feels like no time at all since I first engaged Bud Webster in one of our book talks. Bud, SF writer Paul Dellinger and I used to meet at the home of Nelson Bond there in Roanoke, who was something of a mentor to both of us (me with collecting SF and Bud with writing it) and we passed many very enjoyable hours talking about the books and writers we love. I can’t begin to express how much I’ll miss those talks. Bud Webster has updated the list of deceased writers whose estates he is trying to track down on behalf of SFWA’s Estate Project. Lafferty’s short story “Slow Tuesday Night” is most memorable to me. The pace of human life has accelerated to such a degree that civilization has split into three shifts, the Auroreans, the Hemerobians, and the Nyctalops. People, laughably, still have the exact same superficial attitudes towards wealth, celebrity and love. “Slow Tuesday Night” is available at this link on the Wayback Machine although to get it to load I had to spit in the back and kick it a couple times, which is to say, click on the “Impatient?” link. SFWA Estates: Can You Help? The SFWA Estates Page is the place for editors and publishers who want to reprint material by a deceased writer and need help seeking permissions.